An intriguing end to season 1! 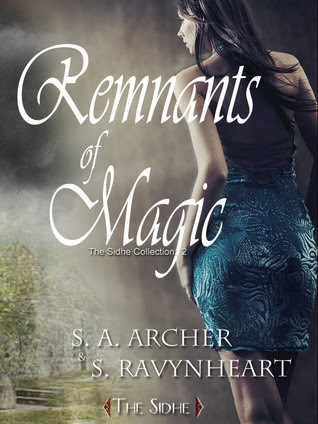 Remnants of Magic explodes into action as London, an enchanted human, becomes a huntress of the Sidhe, determined to claim by force the addictive magic that she’ll die without. But making enemies of the dark Unseelie sets her on a path that entangles her in the fate and the future of the Sidhe. Suffering from the Fade, Lugh fights to reclaim the lost relics that will restore the magic of the fey, a near to impossible task. Then an act of treachery poisons him with a darkness he can not purge and threatens to destroy him and all hopes for the fey. With a magical war brewing on more than one front, Donovan strives to train the teen-aged ‘earthborn’ Sidhe into a fighting force capable of defending the fey. But one of the earthborns is a dangerous wild card, compelled by instincts he doesn’t understand and can’t control. As a reminder: I’ve read all these stories as they came out in the serialized installments. Now I’m reading them as a collected whole. This book comprises the 2nd half of the 1st season. Holy wow. If I were to say that THINGS HAPPEN this time around, y’all would understand what I’m saying, right? THINGS HAPPEN! BIG THINGS! Things that are going to have a huge impact on the future of the Sidhe if I’m reading the cards right! First and foremost, I am completely in love with the Unseelie side of the storyline (and I have been from the beginning). I love how Donovan *cares* about his earthborn Sidhe. He pushes them hard because he can’t stand the thought of them being unable to defend themselves. He holds them back on the tasks he knows they’re not ready for. He has plans to use them but not at the risk of their well-being. I respect that about him. He’s a good leader. I do think he sometimes lets his prejudices toward the Seelie blind him, but he’s trying his hardest to give those that survived and those that have been displaced by the collapse of the mounds a safe place to congregate. I flat out LIKE the guy and I’m very excited for some of the things that I see coming for him down the road. Meanwhile, Lugh is getting his dark on. For a being who is represented by the sun and whose magic is pure light, this is not a good turn of events. However, his descent into darkness gives London a purpose she didn’t have before. It refines her and weaves her firmly into the big picture of saving the Sidhe. I’m not going to lie, Dark Lugh is the creepy sort of awesome that I can totally get behind. I imagine that things are going to get very bad before it starts coming together again. This book is chock full of threads and whispers of things to come. BIG THINGS. I’m SUPER excited to see where all these new findings take us. What do you mean by season? That makes me think TV show:) How many of the installments are in this first volume/collection? It sounds like a fantastic world with really great characters, and if it got a 9 from you then I want to read it:) I want to know all the BIG THINGS that happen! I’m going to refer you to my most recent review on my blog because it has the reading order of the individual installments, links to the 3 arc installments, and links to the series books as a whole. All the goodness you can handle. And then some. Honestly, the way this is written is a lot like a TV show. These books gave us the answers to what caused the Mounds to collapse and a general direction that the survivors are taking to keep from dying most horribly but there’s still A LOT left to be explored. BIG THINGS, JENNY! BIG THINGS!